Installing laminate floor boards along an angled hallway follows much the same installation procedure as installing the boards onto any other wooden subfloor. The boards are laid into place, attached to one another using the tongues and grooves along their edges and extended the length of the hall. The difference in the installation lies in the hallway ends where the hall meets the adjacent floor surfaces. For a smooth transition between surfaces, you need to cut the hall’s boards at an angle to match the angle of the hallway, followed by the laying of a transition strip between the surfaces. Run floorboards in rows down angled halls, creating angles at the ends of the hall for easy placement. Sweep debris and loose dirt from the floor with a stiff-bristle broom. Clean the swept subfloor with a pH-neutral cleanser and a damp mop without saturating the wood. Rinse with clean water and let the floor dry for about two hours. Remove the baseboards along the edges of the hallway with a pry bar. Slide the tip of the bar behind the boards where the nails are located, then pull the board away. Place a layer of rosin paper over the subfloor, stapling it securely into position and cutting it to fit with a utility knife. Cover the rosin paper with a layer of foam underlayment. Cut the underlayment to fit the hallway with the utility knife. Line the walls with 1/4–inch spacers to create a gap between the floorboards and the walls, allowing room for floor expansion and movement without buckling. Lay out the first row of laminate floorboards against one of the walls with the ends of the boards overlapping the end of the hallway into the next room, and the groove along the board edges against the wall. Place a straightedge over the end of the floorboard where the next room’s floor covering meets. Draw an angled line along the board with a pencil, using a straightedge to keep the line straight along the line of the adjacent flooring beneath the board. Move up the board an inch and draw a second angled line onto the board parallel to the first. Remove the board from the floor and cut it along the second angled line using a circular saw. 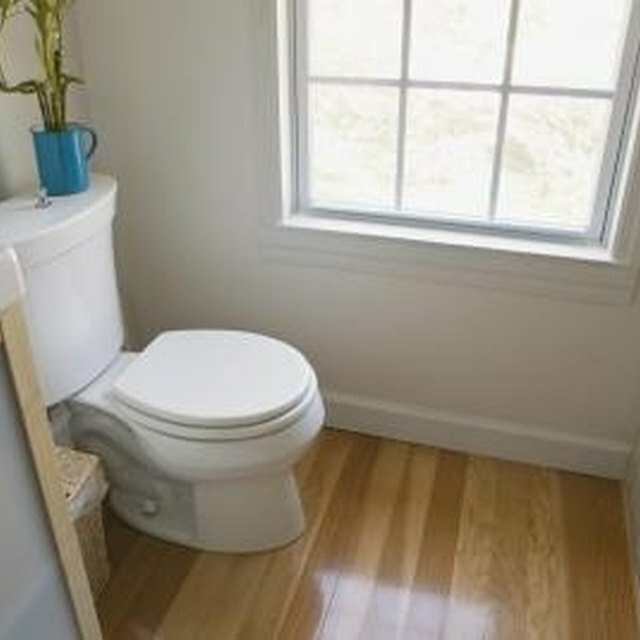 Replace the board onto the floor, leaving the 1-inch gap between floor surfaces to allow for the installation of a transition strip between the hall and the other floor surface. Repeat the process at the other end of the hallway. Cut each additional row of boards using the same process as the first to angle the board edges the same while leaving space for the transition strip. Attach the next row of laminate floorboards against the first by holding the board groove against the tongue of the laid boards at 45-degree angles, slipping the groove over the tongue and then pressing the boards flat against the floor to lock the groove onto the tongue. Stagger board joints between rows, either by using the end of the last board cut from the first row to fit the hall length or by cutting a new plank down 16 inches to start the new row. Continue placing each row of boards, first cutting the ends at an angle and then fitting the boards in place. Cut the final row of laminate floorboards along their length as well, so that they fit along the second hallway wall while maintaining the 1/4-inch wall gap. Measure the length of the transition space with a tape measure and cut a floor transition strip and base to fit. Glue the base to the subfloor between the adjacent floor surfaces with construction adhesive and then glue the transition strip into the base, covering the edges of both the angled hallway planks and the room flooring adjacent with the T-shaped top of the transition strip. Replace the baseboards along the walls by nailing them back into place with a hammer.